An article published in 1874 described a man who invented "solar armor." The armor counteracted the heat of the sun, cooling the wearer more the hotter it grew outside. 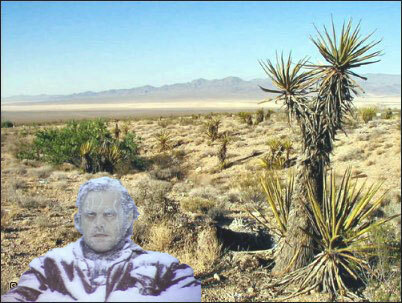 The invention worked so well that it caused a man to freeze to death in the middle of the Nevada desert during the Summer. Accounts of this remarkable invention appeared in papers throughout America and Europe. However, the story wasn't true. It was the satirical creation of Nevada writer Dan de Quille. SAD FATE OF AN INVENTOR (SOLAR ARMOR) — A gentleman who has just arrived from the borax fields of the desert regions surrounding the town of Columbus, in the eastern part of this State, gives us the following account of the sad fate of Mr. Jonathan Newhouse, a man of considerable inventive genius. Mr. Newhouse had constructed what he called a "solar armor," an apparatus intended to protect the wearer from the fierce heat of the sun in crossing deserts and burning alkali plains. The armor consisted of a long, close-fitting jacket made of common sponge and a cap or hood of the same material; both jacket and hood being about an inch in thickness. Before starting across a desert, this armor was to be saturated with water. Under the right arm was suspended an India rubber sack filled with water and having a small gutta-percha tube leading to the top of the hood. In order to keep the armor moist, all that was necessary to be done by the traveler, as he progressed over the burning sands, was to press the sack occasionally, when a small quantity of water would be forced up and thoroughly saturate the hood and the jacket below it. Thus, by the evaporation of the moisture in the armor, it was calculated might be produced almost any degree of cold. Mr. Newhouse went down to Death Valley, determined to try the experiment of crossing that terrible place in his armor. He started out into the valley one morning from the camp nearest its borders, telling the men at the camp, as they laced his armor on his back, that he would return in two days. The next day, an Indian who could speak but a few words of English came to the camp in a great state of excitement. He made the men understand that he wanted them to follow him. At the distance of about twenty miles out into the desert , the Indian pointed to a human figure seated against a rock. Approaching, they found it to be Newhouse still in his armor. He was dead and frozen stiff. His beard was covered with frost and - though the noonday sun poured down its fiercest rays - an icicle over a foot in length hung from his nose. There he had perished miserably, because his armor had worked but too well, and because it was laced up behind where he could not reach the fastenings. The marvelous stories which come from "the plains" are apt to be received with incredulity by our transatlantic kinsmen who dwell upon the Eastern seaboard of the United States. We confess that, although the fate of Mr. Newhouse is related by the Western journal au grande serieux, we should require some additional confirmation before we unhesitatingly accept it. But everyone who has iced a bottle of wine by wrapping a wet cloth round it and putting it in a draught must have noticed how great is the cold that evaporation of moisture produces. For these reasons we are disposed to accept the tale from Virginia City in the same frame of mind which Herodotus, the Father of History, usually assumed when he repeated some marvel that had reached him—that is to say, we are neither prepared to disbelieve it wholly nor to credit it without question. We are glad that the Telegraph has given us the opportunity, long awaited, of publishing in detail the sequel to the curious affair... A fortnight after our account of the sad affair was published, we received a letter in regard to the matter from one David Baxter, who states that he is Justice of the Peace and ex officio Coroner at Salt Wells, a station in Inyo County, California, situated at the head of the Sink of Amargosa River, at the north end of Death Valley. Mr. Baxter states that he held an inquest on the body of the deceased, Newhouse, in due form, and that the verdict rendered was as follows: "We find that the name of the deceased was Jonathan Newhouse, a native of Knox County, Ohio, aged forty-seven years; and we further find that deceased came to his death in Death Valley, Inyo County, California, on the 27th day of June, A.D. 1874, by being frozen in a sort of coat of sponge called a 'solar armor,' of which he was the inventor and in which he was tightly laced at his own request, said 'solar armor' being moistened with some frigorific mixture, with the precise nature of which we are unacquainted." Viewed in the flood of light which Mr. Baxter throws upon the strange death of Mr. Newhouse, we think there can be but one opinion in regard to it; which is, that he fell a victim to a rash experiment with chemicals with the nature of which he was but imperfectly acquainted. In conclusion, it only remains for us to state that Mr. Baxter informed us that it was his intention to send the bottles and jars of chemicals to the Academy of Sciences at San Francisco; also, the solar armor, in case he could recover it. Whether or not he has done so we cannot say. For several weeks we have closely watched the reports of the proceedings of the learned body named, but as yet have seen no mention made of either the chemicals or the armor. Richard Dwyer and Richard Lingenfelter (eds.). Dan De Quille, The Washoe Giant. University of Nevada Press, 1990: 185-191. De Lancey Ferguson. "The Petrified Truth," Colophon, 2 (Winter 1937): 189-96.